Hispanics have grown more satisfied with the nation’s direction and more confident in their finances since 2011, according to a new survey from the Pew Hispanic Center, a project of the Pew Research Center. Today, half of Latinos (51%) express satisfaction with the direction of the country, a 13 percentage point increase over 2011, when 38% said the same. One-third (33%) now report that their finances are in “excellent” or “good” shape, up from one-quarter (24%) who said the same in 2011. And looking forward, Latinos have grown more optimistic about their family’s finances in the next 12 months, with three-in-four (73%) expecting improvement, up from 67% who said the same in 2011. These changing assessments about finances and the country’s direction occur as some economic indicators recently have improved for Hispanics. In the third quarter of 2012, the Hispanic unemployment rate was 9.9%, down from 11.2% in the third quarter of 2011. The Hispanic unemployment rate is also now below its level at the end of the Great Recession in the third quarter of 2009, when it stood at 12.7%.1 The poverty rate among Hispanics has also declined, falling to 25.3% in 2011 from 26.5% in 2010 (DeNavas-Walt, Proctor and Smith, 2012). However, other economic indicators illustrate the difficult times that Latinos have faced since the onset of the Great Recession. Driven mainly by the collapse in the housing market, median household wealth among Latinos declined by 58% between 2005 and 2010 (the latest year for which such figures are available), more than that of either whites (18%) or blacks (54%).2 In 2007, for the first time, the number of Latino children in poverty surpassed the number of white children or black children living in poverty (Lopez and Velasco, 2011). And by their own assessment, Latinos say they were hit harder by the recession than any other group (Taylor, Lopez, Velasco and Motel, 2012). Nonetheless, the Pew Hispanic survey finds that, compared with the public as a whole, Hispanics are more satisfied with the country’s direction. Just 31% of the general public (Pew Research Center for the People & the Press, 2012) says they are satisfied with how things are going in the country today, compared with 51% among Hispanics. When it comes to personal finances, Hispanics’ self-assessments, while improving, are not as positive as those of the general public. One-third (33%) of Hispanics say their current situation is “excellent” or “good” while 43% of the general public says the same. On the other hand, Hispanics are somewhat more optimistic than the general public about the future of their family finances. Some 73% of Hispanics say they think their finances will improve in the coming 12 months, while 67% of the general public says the same. During this year’s presidential campaign, the issue of jobs and the economy has been a top concern for Hispanics, just as it is for the general public. According to the Pew Hispanic survey, 47% of all Hispanics rate the issue as “extremely important” to them personally (Lopez and Gonzalez-Barrera, 2012). Among Hispanic registered voters, 54% rate jobs and the economy as extremely important. This report is based on a nationally representative bilingual telephone survey of 1,765 Latino adults with a margin of error of 3.2 percentage points at the 95% confidence level. The survey was fielded from September 7 to October 4, 2012, largely before the first presidential debate, which occurred on October 3, 2012. For a full description of the survey methodology, see Appendix B. The report is also based on a Pew Hispanic Center analysis of the U.S. Census Bureau’s Current Population Survey data. In addition, the report uses poverty and household income data published by the federal government. This report explores the economic attitudes and experiences of Hispanics. It is based on an analysis of several data sources. 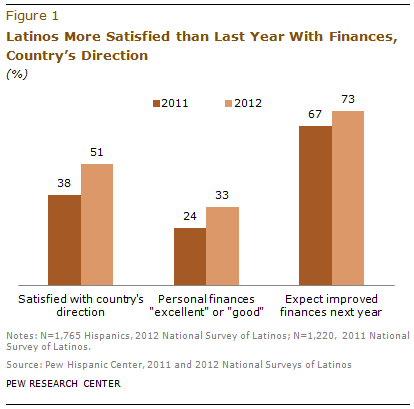 Hispanic attitudes and financial self-assessments are based on the 2012 National Survey of Latinos (NSL). The survey was conducted from September 7 through October 4, 2012, in all 50 states and the District of Columbia among a randomly selected, nationally representative sample of 1,765 Latino adults. The survey was conducted in both English and Spanish on cellular as well as landline telephones. The margin of error for the full sample is plus or minus 3.2 percentage points. Interviews were conducted for the Pew Hispanic Center by Social Science Research Solutions (SSRS). The report also contains an analysis of unemployment rate trends among Hispanics and other groups based on Pew Hispanic Center tabulations of the U.S. Census Bureau’s Current Population Survey (CPS). In addition, statistics on poverty rates and median household income published by the federal government are used. This report was written by Associate Director Mark Hugo Lopez and Research Assistant Seth Motel. Paul Taylor and Rakesh Kochhar provided editorial guidance. The authors thank Paul Taylor, Scott Keeter, Leah Christian, Ana Gonzalez-Barrera, Rakesh Kochhar, Rich Morin, Kim Parker, Eileen Patten and Antonio Rodriguez for guidance on the development of the survey instrument. Patten number-checked the report. Molly Rohal was the copy editor. “Foreign-born U.S. citizens” refers to persons who indicate they are “foreign born” and who indicate they are U.S. citizens. “Foreign-born legal residents” refers to persons who indicate they are foreign born and who say they have a green card or have been approved for one. “Foreign born who are not legal residents and not U.S. citizens” refers to persons who indicate they are foreign born, who say they do not have a green card and have not been approved for one, and who indicate they do not hold U.S. citizenship.